New York City. For many of us who do not live here, it brings to mind thoughts of Broadway, the Twin Towers, yellow taxis, Central Park, the Dakotas, the Yankees, skycrapers, Statue of Liberty, Wall Street, the Bronx, and the Empire State Building. It really is a city that never ever sleeps. Full of life and vibrancy. Sunday, The Professor and I went into the city so I could meet some new friends from blogland. It can be a little intimidating meeting new people that you've met on-line. Will they like you? Will you like them? Sort of like on-line dating. That is ... if you've ever done that sort of thing. And yes ... I did. Twelve years ago. That's how I met The Professor. We hit it right off and have been together ever since. Of course, he never expressed in his user profile his love for sports. And I, who never watched sports, has learned to accept this .... sort of. But back to my purpose in the city. To meet my new friends. Daryl, Kate, Lauren and Ann. I think we hit it off just great. I was so relieved! We walked, we laughed, we ate, and drank and shared bits and pieces of our lives. And our cameras clicked away at the city sights. 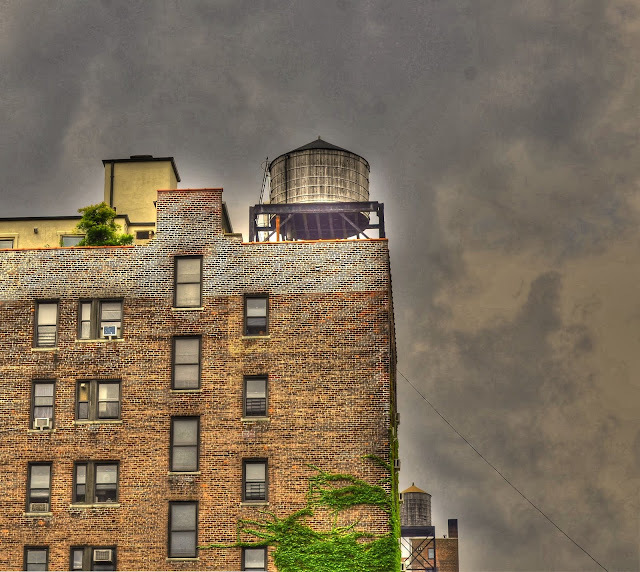 I particularly have a fondness for the water towers that hover above the apartment buildings. Being a farm girl who grew up with water that came from a well deep in the ground, I marvel at these individual water towers. Most small rural towns usually have just one water tower and can be seen for miles. There are just so many in the city. Someone really should do a coffee table book! I'd buy it! 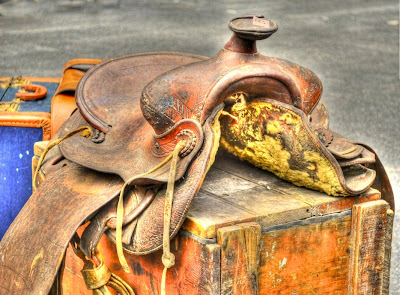 The five of us wandered around a couple of farmer and flea markets and I happened across this old saddle. I thought it a rather odd contrast to the city. Do you suppose somebody has a pony they are keeping in their courtyard? And perhaps the best laugh of the day came when Daryl gifted me with this pigeon. Don't worry. Not a REAL pigeon. It's made out of wood. You see it sitting here on my patio joining all the other feathered friends who visit my backyard. Daryl thought my bird blogs were a bit lacking without a pigeon being represented. Just one other thing the city is well known for! Hope your week has gotten off to a great start. Love, love, love your photos! YOU should do the coffee table book. Your pictures are outstanding! Terrific captures and, I too, love the textures! What a fun day, too! I've had a number of those, meeting up with blogging friends and it has always been super fun! Look forward to the next time as I'm sure you do! Hope your week is off to a great start, Reena! Enjoy! Oh by the way kill me now they are so frickin gorgeous. My water towers never looked so good. I am happy to see Walter enjoying your backyard. 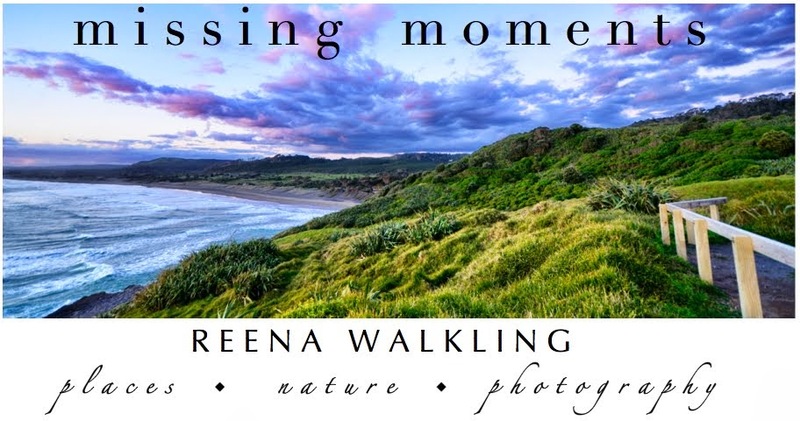 Reena what absolutely wonderful pictures. Whatever HDR is I love the effect!! I'm glad to hear you had a great weekend meeting new frineds. Thus far I've met one blogging friend. There are lots of nice people in blogville.Now that I'm retired I hope to be able to meet more. I don't know what you did with this set of pictures but it looks pretty cool, especially the first one. It really works on the street scene. No doubt whatever you did involves more than two clicks of the mouse button so I'll not even ask how. Very nice. 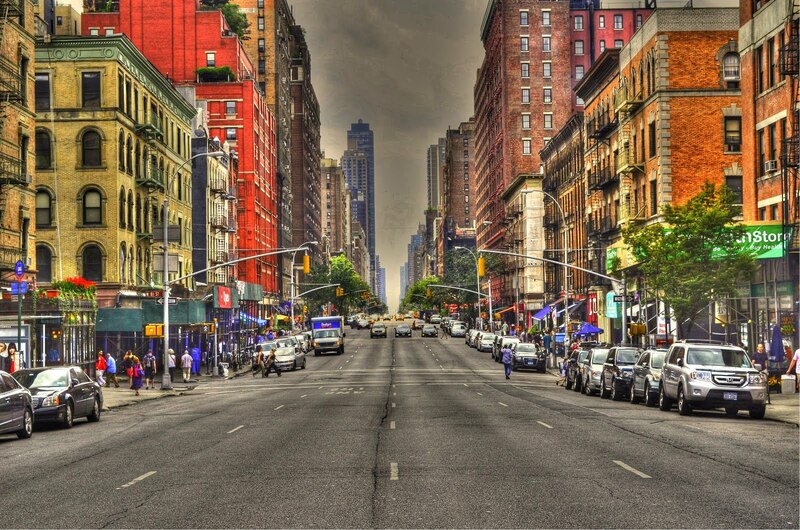 I love the whole idea of New York City...wasn't fond of the dirty air. But the energy is delicious! I had no idea about the water towers!! I guess there is no room there for the huge ones like in the rural areas. How fascinating, really!! 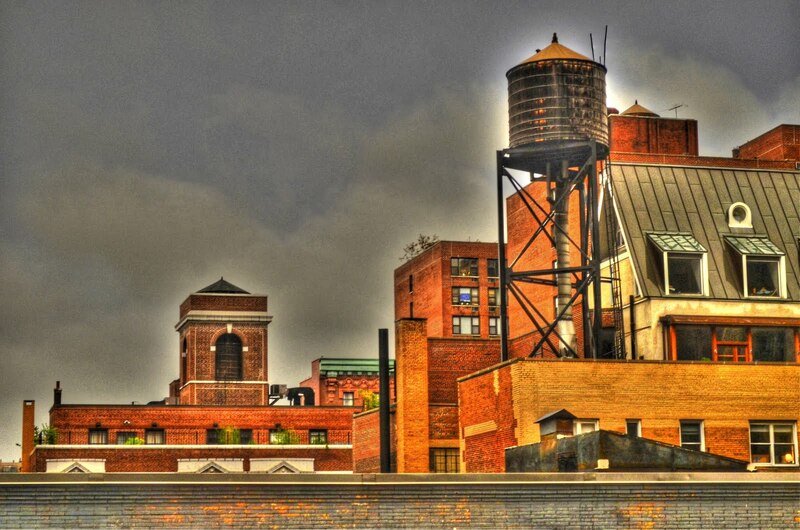 Those water towers, combined with your effects, make New York look like back in the thirties or forties!! These pictures really are timeless...The only thing in any of them that tells you when they were taken is the cars. And I love the pigeon, what a perfect gift he picked out for you! I love your city images...such retro feel and look! Glad your meet-up went well...I am planning one next month and I am nervous! And the mouse we did catch eventually.... Not with sausage, but peanut butter! Glad you had a great time with your galpals! You're photos are awesome - they look electrified!! Sounds like such a fun day - I've never been to NYC and am aching to go. 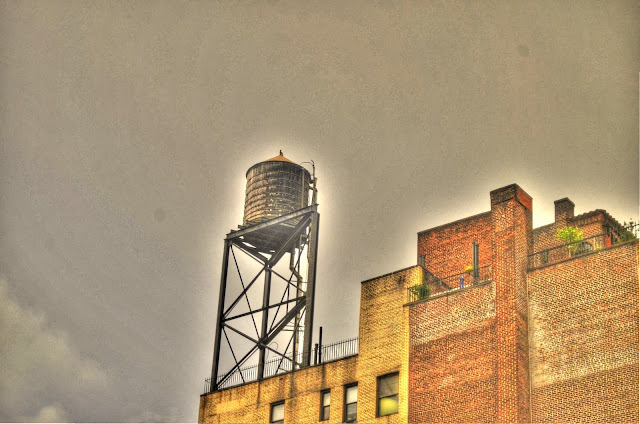 I never knew about the water towers, so WHEN I go, I'll be sure to look for them. Love that pigeon! I watched a documentary on these towers. No wait, it was an episode of Dirty Jobs. You would not believe what they have to do to keep them working. I love your pictures and the textures. They look like paintings in a book! I'm glad you had a great time, and I'm glad you brought home a new friend!! I'm sure he will have an opinion of his new digs as soon as he gets over being shy! Love that first shot - a little HDR magic! Oh that is so Daryl... and Walter Pigeon.. too funny. Your photos are lovely.. that first one could be a poster. I think that your Images that are in HDR are real nice. A job well done. We have been to NYC 3 or 4 times in the past. You are right about the City never sleeping. There is something always going on. Traffic, taxi's, fire engines, ambulance's, and hundreds of people each going somewhere and always in a hurry. We enjoy the City and all that you can see. Last time there we went to see Ellis Island & Lady Liberty. However, the weather did not favor us that day. Was cold, rainy, windy, and just plain miserable. We will return to NYC in the future. That HDR looks like old postcards. I saw your picture on Kate's blog. You two could be sisters! That first photo with an HDR effect is absolutely fab. I've been experimenting with it a bit and I do like it on bricks and old buildings. That first photo? Totally crushing on it. I couldn't believe how many Nikons we had between us. It was fun. L.O.V.E that first shot! You clever girl, you!! Glad you got to meet some fellow blog peeps. You guys seem to have quite a few congregated together. Us southerners are spread few and far between. Wow! Love that first shot with the vantage point from the middle of the road!! The HDR is cool too. LOVE the HDR effect! I've been in NYC just once, about 16 months ago. I, too, fell for the ubiquitous water towers, so I did a little research about their origin. It's so interesting to see the vintage-looking water tower juxtaposed with a modern glass building. 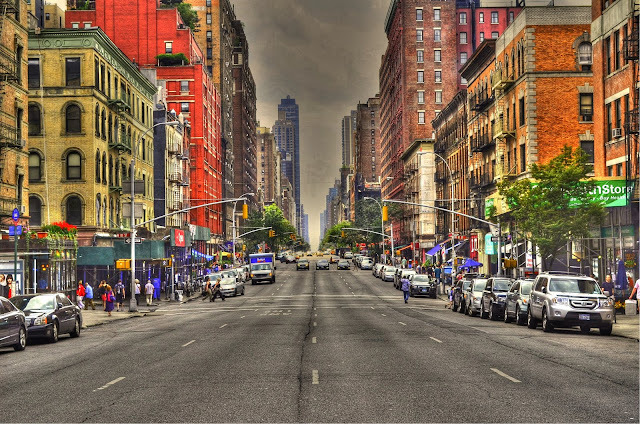 Wonderful images of a city I hope to visit again next year, where our oldest son is executive chef of a Brooklyn restaurant. Love your city images and the effect you put on them. Makes them really pop. Hopefully sometime we too can meet! 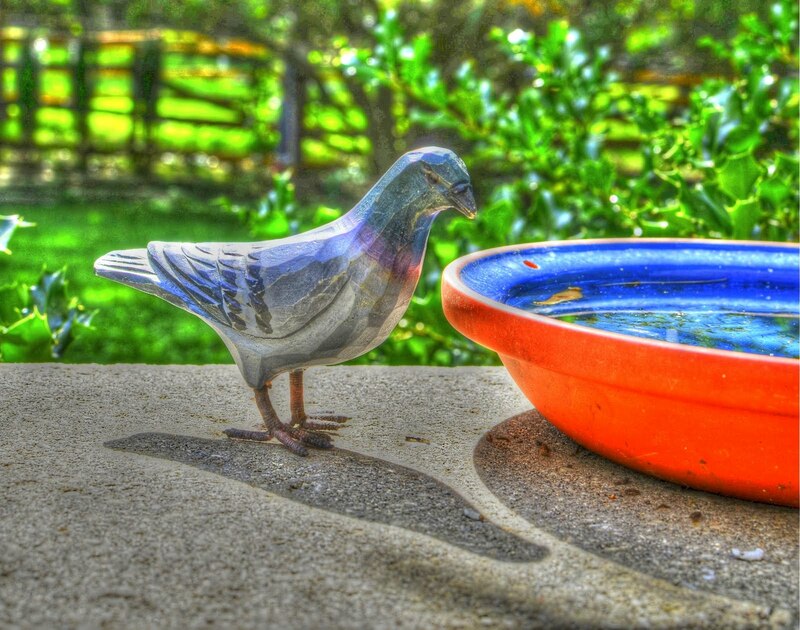 Great HDR images. I really like the color range. I hope to meet some blogging friends one day...just hasn't worked out yet and I probably am a little nervous about it:) Sounds like you all had a lot of fun! The city looks quite different and far more lovely in HDR! Stunning shots. Great shots and now I am going to have to experiment with HDR..
Great shots, Reena! I love the HDR. The first shot is awesome. Well done! I am glad you had a great time in NYC with your new friends. Have a great day! A very vibrant visit to the Big Apple. So pleased things worked out and you had a great time. Wow these are fabulous. I love the hdr look and you did it so well! I especially love the colors in the first one. The water towers are interesting. I didn't notice them on my trips to New York years ago. Sounds like you had a fantastic trip visiting New York and your blog friends. And that wooden pigeon looks perfect sitting on your patio by the bird bath! Gorgeous captures! I love your new pigeon. how fun...and what a beautiful trip you just shared with us. i'm so jealous you got to me kate and got to spend a day in the city !! Beautiful shots, even if I do now have to go off and find out what HDR is. I have to admit that I don't like cities. Even smaller ones give me the heebee jeebees. The last time I went to NYC was over 35 years ago, and I was very glad to get back home. Dadgum it, I come by just to respectfully pay a visit and you've hooked me! I haven't met any fellow bloggers yet, but I have met up with a group from a forum I frequent - we all went to Disneyworld together. Yes, it was nervewracking leading up to it, but we ended up having a terrific time...and one of the members from Denmark is coming to li'l ole Pleasant View, Tennessee to visit me this fall! Wow, these are fabulous!!! I love love the HDR!!! Amazing work! A truly wonderful city, and your photographs of it are just gorgeous Reena! How much fun that must have been to meet up with fellow bloggers! Nice job on these. Like the city shots a lot! Have a great day! wow, i just love that first shot!!! It was pen friends back in the day isn't the digital age fantastic!! I'm glad you enjoyed the day in NYC with your on-line friends (and The Professor before)! 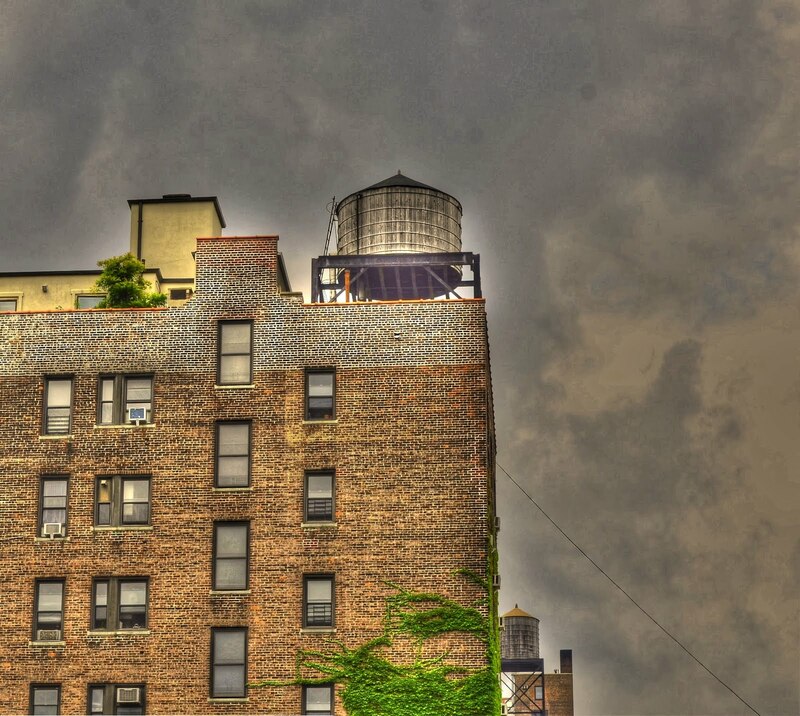 Water towers look so strange also to me and your photos are really stunning (love their colors)! Your photos are almost reminiscent of a fantasy. Glad you had such a fun time! What a great idea to meet in "real life"! What a great combo - NYC, cameras, and blogging friends! Sounds like a fun trip and love the photographic results! Stunning photos. What a great time you all had! Wonderful series of photos. Sounds like you had a great time. I've never noticed the water towers before. I will certainly make a point of looking next time I visit. These are wonderful shots and I love your processing! I like the wooden pigeon too! oh, you have to tell the whole story about how you met the professor! or maybe you posted it before i began following you...if so, link please! Oh, wow! That first photo is stunning! I love it! Oh you and these fancy schmancy pictures!!!! Love them all. And you! That pigeon is priceless....I hope he doesn't scare all our other friend away. I LOVE these! Especially the bird! 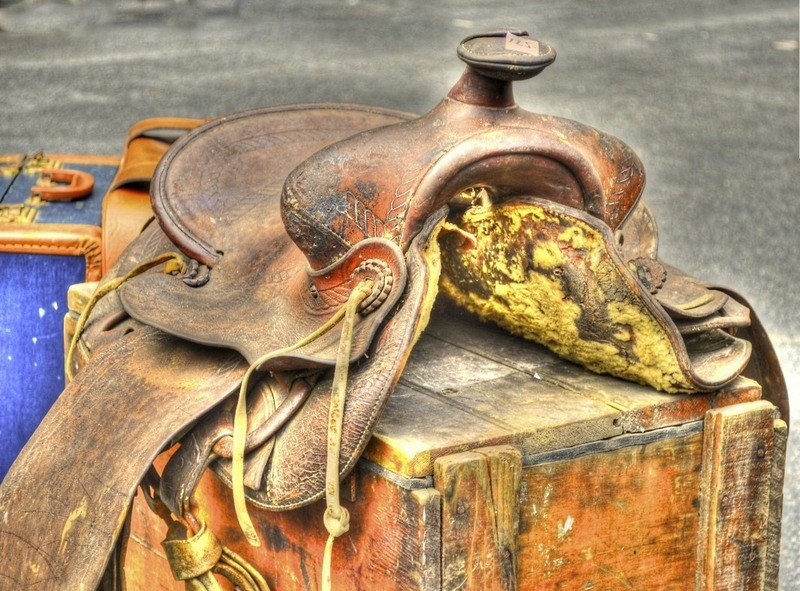 I WANT THAT SADDLE!!! I love antiques. I bet you had a really nice time in NYC. I think Daryl did a proper gesture in giving you that bird. I have pigeons flying, nesting, mating, playing on my roof. All decked out in their regular colors - greyish blue, black and white. Then one day I saw an all white one. Had to be a girl - I thought to myself. Wonderful. Cheers!! Wow, wonderful photographs. I'd buy a book filled with just the first photo! And I met the Artist the same way. Thank you for convincing me that online dating sites are not a massive waste of time. Wish I could be more like you and make a great connection with my plentyoffish.com account (AND take equally gorgeous photos). I really liked the 1st photo from this blog post. I liked it so much that I decided to use it as a background in my M60A3 Patton image. I hope you don't mind...as common courteous, I credited and referenced your website from my portfolio. Keep up the great work!